If you have ever felt you are not living up to your full potential…not making enough money for the lifestyle you dream of…lack the inspiration you once had… then this letter could hold the key to unlocking your future prosperity. It’s a secret that most people don’t want aired…like their dirty laundry. …and crack open a window into my private life. I started as a struggling salesperson for a gym…just barley signing-up enough new members to make a living…only one step away from being tossed out of my studio apartment and forced through circumstance…to live in my car. And how to harness that power into receiving a YES. The more I learned…the easier it became for me to receive Yes after Yes. Every person who walked through my gym’s front doors turned into another notch on my sale’s belt…all by knowing how to aim my message directly at their unconscious. When I stepped onto the gym’s floor, it was if I became another person…confident, calm, cool, collected. I quickly turned into the go-to guy when one of my coworkers needed help making the sale…and it was only a matter of “when” before I was promoted to our gym’s top dog. And anyone who got to close, would see my carefully built walls starting to crumble. It didn’t matter that I was bringing home fat commission checks every week…no matter how much I made, I was still living the continuous cycle my unconscious only knew. I was spending more then came in…living paycheck to paycheck…fear of the next past due notice when I went to pickup my mail. To those looking in…I was still the Yes Receiving Machine, the record holder, someone to come to for guidance. But, I knew the difference, by the deceptive smile I put on each morning as I rolled out of bed and prepared myself to step through the gym’s front doors. It was my “Ah-Ha” moment…that lead me to the secrets of not only hearing YESes in my daily communication, but Hearing YES From Deep Inside Myself. I was becoming a master at controlling others’ unconscious minds…but had zero control of my own…and needed to put an end to the lies I was telling myself just to make it through the day. My business life was gaining more momentum every day…but my personal, financial and family life still had no structure…no development…no goals. My unconscious and conscious minds were locked in a battle of wills… Although I logically knew I should be able to pull myself up by the bootstraps and climb out of a situation of my making. And, since we are all creatures of habit…I was stuck with the patterns that were already imprinted on my unconscious…stopping me from reaching and holding onto my goals. If I wanted to change my life for the better…I knew I needed to find a way to change the programming that had been installed within my unconscious…and replace it with a new operating system…which would allow me to reach my full potential. I took a long hard look into my past…and not just the current past, but as far back as I could remember. And, pattern after pattern started to emerge. Just as our unconscious minds are tasked with maintaining the equilibrium for our internal body functions…temperature, heart rate and countless other life sustaining activities…I was learning these are not the only aspects of our life that the unconscious imposes its will on. You see…living things don’t react well to change and…just like a rubber-band, no matter how far you manage to stretch it, it will always snap back. It didn’t matter how much I raised my earning potential – at the current rate, I would end up back where I began. I had unknowingly upset the balance my unconscious mind had imposed…and it was preventing me from reaching and holding onto my goals. What is one goal that remains just out of your reach…no matter what you do? Maybe, you hit your target weight loss, but after a month or two you always seem to balloon back to your original weight. Maybe, you managed to save some money for a rainy day, only to spend it in order to impress your friends and family..
Or…maybe, you finally made a commitment to spend time with your family, but broke the promise because you had to work. I was not destined for failure. I was not one of the so-called “unlucky” ones. The universe was not plotting against me…I could still get everything I wanted out of life! And…once I discovered that the problem stemmed from the unconscious mind…I knew there was an answer waiting to be found. Using my 20 years of education, studying the unconscious, I started to develop a step-by-step process that allowed me to teardown ALL self-imposed limitations and reset my goals…to achieve my every desire. My eyes where now wide-open to see and create new opportunities in all aspects of my life. I was no longer self-sabotaging my success…my future. I no longer lacked drive…focus. I was once again filled with inspiration. It took 9 years to develop the process responsible for my continued success. I drew from my diverse background, including NLP and hypnosis. I researched all subject matter from ancient texts to the popular law of attraction. And, I tested it all…to find out what works and what is a flaming pile of dog ****. I had created a step-by-step process that allows me to reprogram my unconscious mind to reach and hold onto my goals…attracting ALL I could possible want. I quickly saved 6 months of living expenses…removing the stress of getting by paycheck to paycheck…worrying about paying my bills on time…and past due notices arriving in the mail. I was now able to identify all areas of my life that needed improvement, erase the faulty programming and drop-in the new code that would allow me to reach all my goals. Our exclusive online component…that will allow you to customize the material to meet your individual needs…easily organizing all aspects of your life…so that you focus your intentions on the things you want most…while keeping a record of your progress throughout the process. Also included are 14 learning sessions, which allow you to reprogram your unconscious for your desired results. These audio files use advanced technology that places your brain in the learning Theta State. By taking advantage of these learning sessions, you will greatly increase the speed of your positive results. The missing skills that can stop you dead in your tracks from success…when I discovered and implemented these…my income tripled in less than 9 months. Why hard work is not always the key to success…and why it can be detrimental when it comes to increasing your income significantly. What you must first do to create the life you have always imagined…almost everyone skips this critical step and places themselves aboard a never ending ride to disapointmentville. The #1 WORST mistake you can make that will turn your unconscious mind against you – ultimately causing you not to live up to your full potential. Why you must take inventory of these 3 areas in order to develop the life you have always imagined. The problem with setting goals and, why by their very nature, they are setting you up for failure. The solution to the goal-setting “problem” that works with the laws of the unconscious mind to achieve your every desire. How to correctly language your wants and desires in order for your unconscious mind to produce results (this goes far beyond simply stating things in a positive manner). How to make your unconscious mind take notice with the addition of these words to your statements (this will supercharge your positive results). The 4 step formula for guaranteed success. Why putting too much attention on the things you want can reverse all your positive results. How one statement implanted into your unconscious will speed up your results. How to ensure you are living a balanced life…staying balanced is an important key to developing prosperity. How to make sure that you are targeting your energy to what you “really” want and who you “really” want to be. The method and strategy I use to eliminate all problems from my life. You can use this to reverse any negatives – from health issues, to fears and even issues of identity. A new way of looking at money and how this little mental shift will attract more wealth and opportunities into your life. Why our words carry great power and how to direct that power to living a fulfilling life. The reason why failure is necessary to keep advancing in your life – this has been a secret of not only the wealthy, but our greatest philosophers of all time. The real power behind being able to forgive – it’s objective is not to make you feel better or to benefit someone else. How to wipe away all resentment from your life – allowing you to move forward instead of taking two steps back. Learn why you should keep your mouth shut when it comes to including others in your plans for a prosperous life. Why going through this program will improve your persuasion skills by leaps and bounds. Another amazing strategy for creating change in yourself and others at a blink of an eye. Discover how to change the way you feel about any memory…this is an extremely powerful technique, so please use with care. 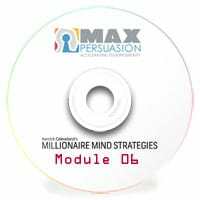 In this module and the Bonus module, we focus on the “millionaire” in Millionaire Mind – installing the strategies of the wealthiest elite into your unconscious through learning sessions. We’ll examine everything that can get in the way of your accumulating wealth. By the end of this module, you will have all the skills you need and more to have a millionaire mind. You don’t need to feel stuck…watching others live the life you want. When every time you seem to get ahead, you end up right back where you began. And break through your self-imposed limitations to focus on what you really want. You will once again BE INSPIRED! Kenrick Cleveland’s Millionaire Mind Strategies will hand you the proven skills you need to reach your full potential…and stay there. So…can you afford to wait to change your life? For all your dreams to become reality? 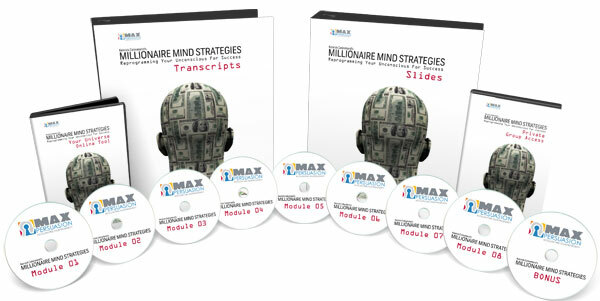 We are offering Kenrick Cleveland’s Millionaire Mind Strategies as a stand alone product. Over the last few months we have been working hard to update our current website technology to work with this programs’s online component…and now it’s finally ready for you. 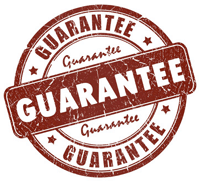 You have nothing to loose with our 100% Money Back Guarantee. When you click the add to cart button, you will have 1 full year to evaluate the program inside our member’s area. I am so confident that this program will change your life that I am willing to refund the order price for one full year if you don’t receive the results promised. *Please note – to be eligible for the 100% Money Back Guarantee, you will have to preform the exercises inside the program and put in the small amount of effort required to make the strategies and skills work. What would that mean to you…to your family? How would your life be different…better? Would you stop at resetting your earning potential or…would you continue using your newly gained skills to improve all areas of your life? Your possibilities are only limited by your imagination. And, by clicking the add to cart button now, you are seconds away from taking control of your own future…and attracting everything you could possibly dream of. Because I know if you don’t take advantage of this offer, chances are, you are not ready to benefit from the information I am offering. This program is designed for people ready to take action and not sit on the sidelines watching their life pass them by. YES and Others Hear No! When you click the ADD TO CART button, you will have instant access to the first lesson in your membership area…the second lesson will follow 14 days later. Learn what’s intention and why if you don’t set your intention correctly you are facing an uphill persuasion battle. Learn what a Baptist Minister and Eminem (rap-star) have in-common – and why when you learn this skill your persuasion abilities will reach new levels. Discover what’s the “true” first step in gaining rapport. It’s not what you think either..when you incorporate this strategy you will find yourself gaining rapport more deeply. Why there is a double edge-sword to rapport…and what you need to be aware of to not have rapport blowup in your face. The quickest, easiest way to gain rapport with someone…without even saying a word (it usually happens at 30 ft away). And those are just some of the skills and strategies you will learn in the first half of lesson one. The persuasion system and how it will simplify the persuasion process for you. What is Criteria – and why it’s a critical aspect to all persuasion. Without this you might as well be a sales-monkey jumping up and down begging for the sale. The step by step process to elicit someones criteria – so your messages are always aimed with pin point accuracy. Learn how to identify if someone is more motivated by the “boot” or the “carrot.” And what you need to know to use this information to your advantage. Want to know what other skills you will learn in The Persuasion Factor? Then Watch the video above or click the buy now button to get started already. Why am I offering so much value for such a small investment? When I first released the Persuasion Factor the membership cost was $99 for 1 lesson a month (a tremendous value). 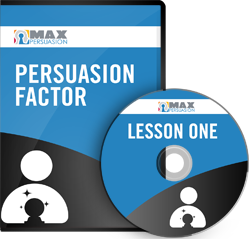 Today when you order the Persuasion Factor, you will receive 2 lessons for only $69 per month (insane value) and your first month is ONLY $34.50 – 50% OFF. It’s simple…the lessons, skills and strategies in the Persuasion Factor are the foundation to everything I teach – please don’t mistake “foundation” for basic or beginner. Yes, the Persuasion Factor is the perfect place for a beginner to start their education on persuasion and influence – but even my most seasoned students of persuasion (who have been studying persuasion for decades) constantly tell me that they immerse themselves in the lessons daily..the Persuasion Factor is their bible to getting into the minds of others. “The Persuasion Factor has had a profound effect on my life, professional and personal. I completely turned from someone who lived in fear of being “found out” and flying by the seat of his pants (i.e. not really knowing what I was doing) into a professional sales person who could not only do the “right things” to achieve the desired goal but could tell you why they were the right things before hand! I know once you learn these skills and incorporate them into your behavior you will experience tremendous positive changes in your life. So I want to make this a “no-brainer” for you to sign-up today! Q&A Once TWICE a Month : If you have any questions along your journey I will be there for you. Once TWICE a month I will be holding a Q&A session to answer any of your questions on the lessons…keeping you on the path to becoming a Master Persuader. I want to remove all the risk in making the decision to join the Persuasion Factor today. First, you will receive two lesson and two learning sessions (over 3 hours of content) for less then a cup of coffee. If after you listen to these two lessons and you feel they were not worth your investment, I will be happy to return your money. Second, you can stop at anytime. If you are ever unsatisfied with the material during this one year course, you can easily cancel your membership by sending in a ticket to support.maxpersuasion.com…you are never committed to stay in the program! I am so confident that The Persuasion Factor is the best course for you to learn how to persuade and influence, that I am going to back it up with a 100% Money Back Guarantee. 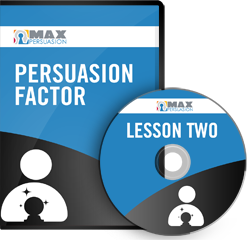 Complete all 23 lessons of The Persuasion Factor and if you don’t think the course was worth 10x what you paid then just call us up and ask for a refund. The only conditions are that you: participate in the course, practice the material and show us that you put in the effort to learn these skills. Still don’t know if the Persuasion Factor is Right for you? All our communication has an element of persuasion. It doesn’t matter if you are asking for a date, asking for a sale, or asking your kids to clean their room – your words and actions either get a yes or no (maybes are no’s). What would you rather hear? Who is the Persuasion Factor Not Right For? If you are expecting a magic bullet that doesn’t require any work then move on …yes I said the “W” word. Even-though this course was designed to integrate all these skills into your life and behaviors as easy as possible (and takes advantage of my “state of the art” learning sessions), it still will take effort on your part. I Guarantee that if you set your intentions to learning these skills and incorporating them into your behavior every hour of “work” will result in a huge return on your quality of life. P.S. 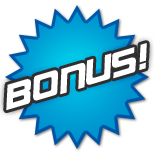 When you click the add to cart button and take advantage of our limited time Persuasion Factor special, you will receive not 1 but 2 modules of the Persuasion Factor for only $69.00 and get month one for 50% off – Only $34.50. Not only will you receive the cutting edge skills you need to get YES’s in all your communication – you will also receive the 2 learning sessions and 2 Live Q&A calls each and every month. All backed by our 100% Money Back Guarantee. This is a very limited time offer and may change at anytime. Click the Add to Cart button now…before this offer disappears. Persuasion Factor was awesome by far the best course I have ever taken. By month six of persuasion factor I received a promotion to upper management with my company, with a large raise. Three months after I managed to increase my raise by another 2%. I have been able to impact the people around me by motivating them or moving them in a direction that is a positive move for them.